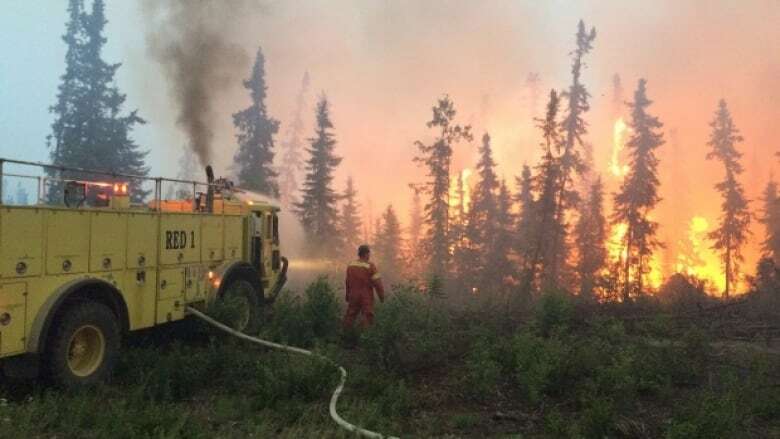 Firefighters have converged alongside Canadian Forces to protect communities which are all but ghost towns, as people by the thousands have fled due to the spreading wildfires. As large swathes of the Canadian forest burn, should we continue to rely on the forest's ability to capture carbon? Over the weekend, Cheryl Harnett and her husband were evacuated from their home in Ramsey Bay-Weyakwin Lake, north of Saskatoon. They're just some of the thousands forced to flee in the face of raging forest fires burning across British Columbia, Alberta and Saskatchewan. The city of Vancouver had been covered in a blanket of smoke from all the fires in that province, but is getting some relief today. Saskatchewan has been hardest hit.... 7000 people are being housed in evacuation centres, run by the Red Cross. In the community of Pinehouse Lake in Northern Saskatchewan... most of the 1300 residents left a week ago. But some remain. Residents of La Ronge have also been forced out of their homes. This morning fires are within two kilometers of some La Ronge homes. Mark Williment lives in La Ronge but is currently staying with relatives in Saskatoon. He is is the superintendent of education from La Ronge, Sasketchwan. Kendall Latimer has been tracking the fires and the response to them. She is a reporter with the Saskatoon Star Phoenix and she says it's difficult for people to tell whether the fires are being handled properly by the authorities because it is such a fluid situation. As devastating as the spread of these wildfires is currently, experts are warning that it could get worse over the coming months. And there are concerns that that the resources we do have to try to tame them, are not enough. Robert Grayis a Fire Ecologist with R.W. Gray Consulting Ltd. He was in Chilliwack, B.C. Share your thoughts with us on anything you hear on The Current. Tweet us @TheCurrentCBC. Find us on Facebook. Or email us from our website. This segment was produced by The Current's Sonya Buyting, Kristin Nelson and Sarah Grant. Tree-faller killed fighting forest fire near Sechelt, B.C.